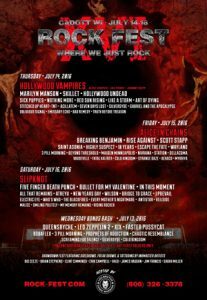 On September 30, 2016 Lou Brutus made his first ever trip to Green Bay, WI to co-host Edge Fest 2016 with his fellow rockers from Razor 94.7. 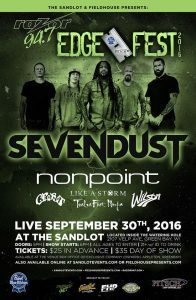 After a visit to Lambeau Field to pay respects to Vince Lombardi it was over to The Sandlot to interview and photograph Sevendust, Nonpoint, Crobot, Like A Storm, Wilson, and Twelve Foot Ninja. Highlights of the night for LB were bringing Crobot onstage by performing a special rap with the band as well as a heartfelt intro for his friends in Sevendust. Following the show, Lou hopped on the Sevendust bus to hitch a ride to Sonic Boom. Many thanks to those of you in the Green Bay and Appleton area for all the love.